Mill Creek Preserve West | Florida Hikes! North of Gainesville, the northern forests make their southern stand. 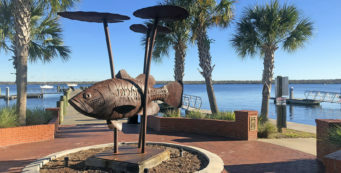 Mill Creek Preserve, north of Alachua and part of the Alachua County Forever registry, encompasses nearly 1,200 acres of unexpected delights in an area well-known for its sinkholes and disappearing streams. By taking a hike, you pass through the curtain of pine plantation you see from surrounding roads and the trailhead and find the real delights—magnificent spruce pines and swamp chestnut oaks towering over a folded landscape that hosts the southernmost American beech forest. It’s amazing to find ancient trees in a spot that’s been a historic crossroads for centuries, thanks to the Bellamy Road and the Old Providence Road. With nearly 5 miles of trails in two loops, it’s a place you can tailor your walk to your interest and time. This route follows the trails on the west side of the preserve. From the I-75 exit for US 441, High Springs / Alachua, drive south on US 441 to the traffic light with CR 235, one block beyond Main Street. Start north. Veer left onto CR 241. Continue 5 miles to its intersection with CR 239. Turn left. Drive another third of a mile to the preserve entrance on the left. 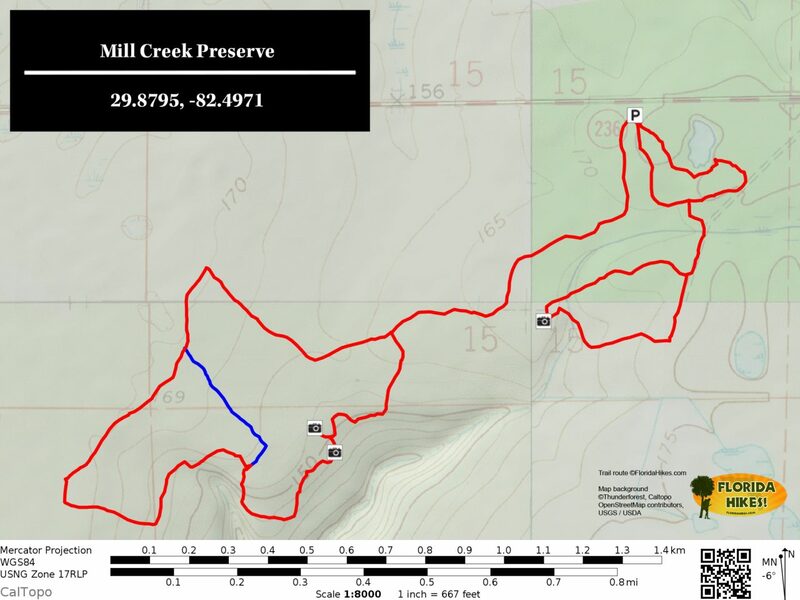 Start your hike by picking up a trail map at the kiosk. Three trails leave the trailhead in different directions. The blue-blazed Marsh Trail leaves the kiosk to do a loop down to a marsh along Sweetwater Creek. 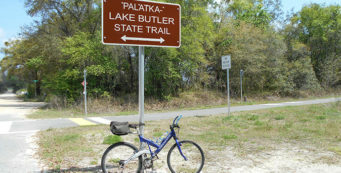 The white-blazed Old Providence Trail heads off in that direction too following the route of a historic Florida pioneer trail. But this particular hike follows the Yellow Trail and its connector trails, since it leads to the southernmost American beech forest, the big “wow” of this preserve. Look for a yellow disk with silver arrow on a “Trail” post, and follow the path along the fenceline to an old road leading back into the preserve. Yellow blazes mark the way. It’s not the most interesting of entry points, but that’s what made this hike particularly intriguing. From the parking lot, and along the first stretch of the hike, all you see is a pine plantation, one of the more boring habitats to hike through. At least it’s shady. I was surprised to learn from the Alachua County Forever staff that this property once belonged to Mr. Goethe, the timber baron who was based in Dunnellon and was a bit of a recluse when we were kids. His sawmill sat along US 41 where strip malls near Walmart are today. 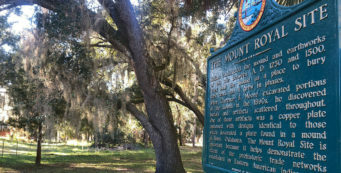 You’ve probably heard of Goethe State Forest, which was part of his land, but he had extensive holdings all other North Central Florida. Here, as in other places he managed, he left the non-productive areas alone and did not clear-cut, which is why the ancient beeches stand today. You reach a T intersection. Turn right. In the understory, which is extremely dense, cardinals make chip-chip noises. There is a slight clearing with several metal posts marking the location of a gopher tortoise burrow so caretakers don’t run over it. 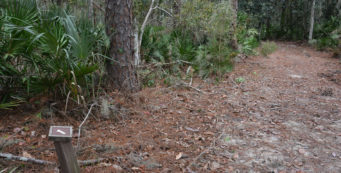 The trail remains a wide forest road, opening up into a small clearing with islands of Southern magnolia and oaks, and more tortoise burrows staked out. Cross the clearing and stay to the right, re-entering the dense forest, here more thick with oaks than pines. At the fork, keep right. You’ll pass a pine-lined path on the left, and a small stand of devil’s walking stick. At a half mile, the trail comes to a junction with a bench. Orange blazes lead left; the yellow blazes continue straight ahead. This hike goes clockwise around the loop, so turn down the shady corridor of hardwoods. As the canopy opens up a little, you can see spruce pines towering overhead. This is an important karst recharge area, and spruce pines – along with swamp chestnut oak, another species you’ll see for the next hour – are indicators that the limestone bedrock is not far beneath your feet. The trail narrows and jogs through the woods as it passes by an immense beech tree with an orange blaze on it. You’re into the slope forest now, and what a beauty it is, with massive trees and an undulating landscape. Rain that falls on these slopes creates the deeply eroded channels that feed Mill Creek, Paraners Branch, and Townsend Creek, which vanish into the aquifer and emerge in the waters of Hornsby and Poe Springs to expand the Santa Fe River. This part of Alachua County is well known by cavers for its sinks. In fact, if you’ve ever seen the Wes Skiles’ documentary where the cave divers are beneath a Sonny’s Restaurant, you passed that restaurant on the way here from I-75. The forest here is a beech-magnolia mix, with sparkleberry and other common river bluff / slope forest trees, such as hophornbeam, along the footpath. Crossing a bridge over a dry creek, the trail makes a sharp left into a more open portion of the beech forest, passing a large fallen log flanked by needle palms and covered in fungi. 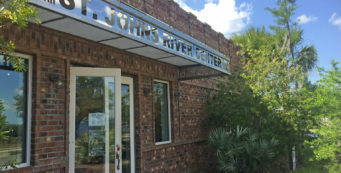 Sandra from Alachua County Forever told us that when the property was acquired in 2002, there were still beavers living here, perhaps the southernmost ones in Florida, along the bayhead areas. While we saw no chewed stumps along the way, birds were plentiful, including sightings of swallow-tailed kites overhead and a summer tanager in the trees. At 0.8 mile, take the side trail to your right. It follows a tributary past a particular large and unusually shaped swamp chestnut oak, its trunk curved away from you. The scenic spot is marked by a bench overlooking a deep spot with exposed limestone, looking like a sink that the ephemeral creek might tumble into—it was dry, so hard to say. Return to the main trail and turn right. Heading downhill, you encounter a kiosk with information about this spot, the southernmost American beech forest. Continue downhill to cross a bridge with a very elaborate design to its sides. The creek beneath it vanishes into the woods to the left as you climb back up a hill. The beech forest opens up again, with the canopy well overhead and the understory open enough for wildlife watching. The trail jogs left to pass two large rootballs, the second bigger than the first, and at a mile, you step through a cut-apart pine as the trail winds through saw palmetto. Passing a bench on the right, the path starts a slow uphill, the beech and magnolia leaves especially crunchy underfoot as the trees get taller, the understory denser. The trace of a waterway rims the landscape on the left. By 1.1 miles, you reach the junction with the green (shortcut) trail. Use this if you need to knock 0.7 mile off the full loop—you’ve already been through the most beautiful part of the hike. We turned left at the junction, staying on the orange-blazed perimeter trail, heading into another stretch of dense young oaks that grew up when pines were removed from the area a decade or more ago. Magnolias and hickories are scattered throughout the dense forest, and you’re apt to see some poison ivy, but not much, creeping into the path. Netted chain fern grows in clusters along the footpath. At the junction of the orange trail and the yellow trail, turn right. The trail quickly broadens to a forest road edged by planted pines. At a clearing, there is a four-way junction of trails, and this can be confusing. Head straight across and keep right, following the broad and grassy path. You’ve walked 1.5 miles. Passing a corner post of the property boundary fenceline and a firebreak, the trail swings right and out into the open sun. A virtual wall of oaks and pines rises to your right, and to the left, the ground is a mess—all cut over, awaiting restoration. The green (shortcut) trail comes in from the left. After 1.9 miles, the yellow trail turns right and heads back into the deep shade of a hardwood forest. Although the trail is still broad, it’s back to being a pleasant walk with the canopy close overhead. Passing through a small clearing, you jog to the right. Within a quarter mile, you close off the loop, coming to the original junction with the orange trail at the bench. Continue straight ahead, staying to the left where unmarked trails go off to the right. At 2.5 miles, you return to the original clearing with the marked gopher tortoise burrows. Continue straight ahead across the clearing and into the woods, down the forest road as you pass the first unmarked junction on the right. Emerging at the trailhead, you finish the 2.8 mile hike.